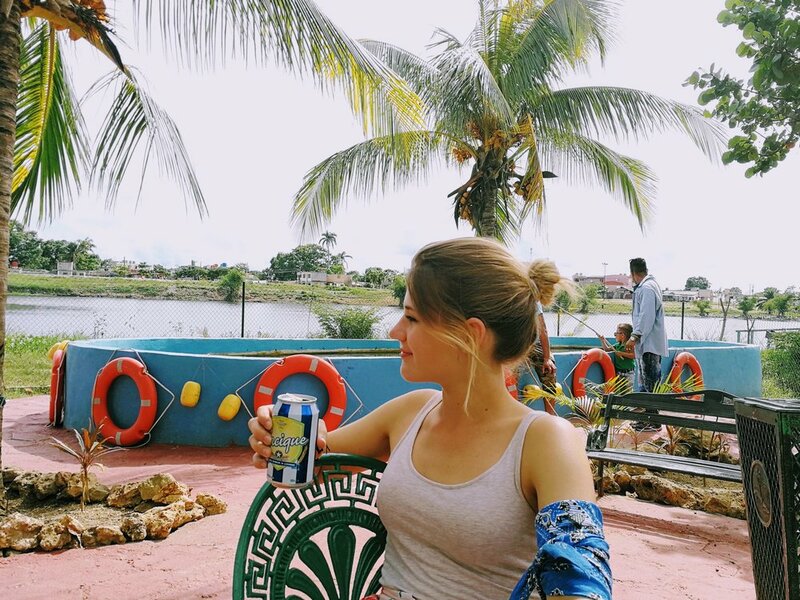 If you find yourself in Ciego de Avila, Cuba for whatever reason, here is a complete list of things to do that will keep you busy during your stay. I wound up in Ciego de Avila for almost two weeks on a Global Volunteers mission to teach English and garden on an urban farm. The city of Ciego de Avila is definitely off the typical tourist path; however the community here is making an effort to encourage tourism. Ciego de Avila is a small bustling city of about 100,000 people in central Cuba that offers the unique opportunity for travelers to get an idea of how Cubans who don’t live in major cities, like Trinidad or Havana, get by on a day to day basis. Most tourists only scrape the surface of Cuban culture and daily life when they visit mass tourist hot spots. Trinidad and Havana are both growing economic hubs flooded with travelers from every corner of the world and Cubans alike - in fact, nearly 30% of the Cuba's total population lives in these two cities. Ciego de Avila, however, is a quaint city whose largest industries are growing sugar cane and raising cattle. Spending a week in Ciego de Avila will give you a sense of the "old Cuba" which is rapidly disappearing in the wake of modern tourism and the decline of Castro's influence. At the heart of this rustic city is Calle Independencia (Independence Street), which is packed with the most important buildings in town: from the happening town hall to the crowded Cabaret Bohemio to the hugely popular two-story Coppèlia ice cream parlour. Every Saturday, starting at 9 p.m., Calle Independencia transforms into a party reminiscent of carnival with live salsa Cubana, rumba, and cumbia music on every other street corner. 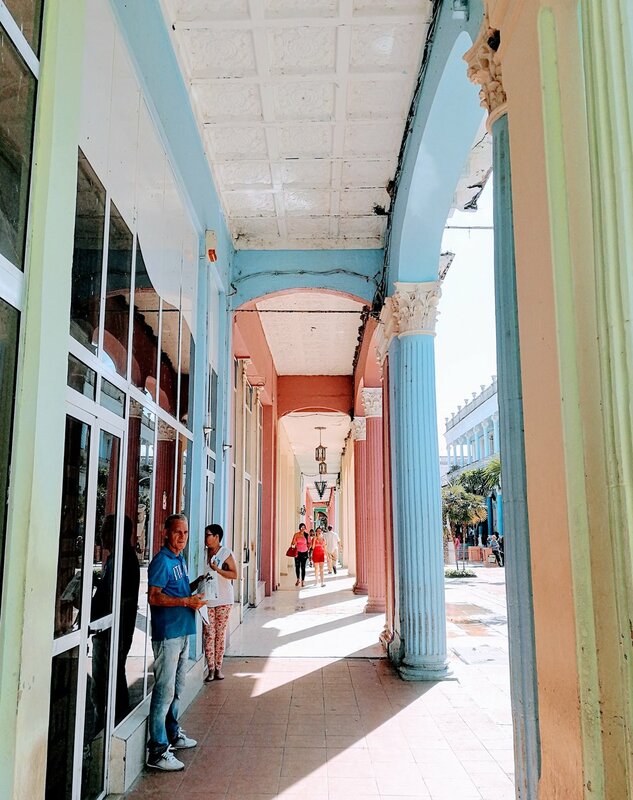 Pastel colored Neo-Roman columns line Calle Independencia, Ciego de Avila’s main street, leading you to Parque Jose Martí where Avilenos go to drink rum, munch on late night street food, and use the public wifi connection. Whether you like to dance or simply enjoy listening to live music, Avileño Night is a must if you wind up in Ciego de Avila! If you are curious to see what locals are doing for fun during the day, take a stroll around the lake in Parque La Turbina. This man-made lake has something for everyone with restaurants full of families, bars playing loud music, rowboats for rent, and even fishing along the shoreline. Although the lake is full of activities, swimming is not one of them – so leave your swimsuit at home. Sundays are especially vibrant on the lake as families gather to unravel from the workweek and enjoy a laid back afternoon in the sun. Ciego de Avila is not known for its food. However, La Casona restaurant is an undiscovered culinary gem. The Chef here whips up a mouthwatering black bean potaje (stew) that will fill your mouth with a series of exciting flavors. This plant based soup offers travelers a break from the typical platos fuertes (main dishes) served at most restaurants, consisting of a slab of meat and a side of rice or fried plantains. 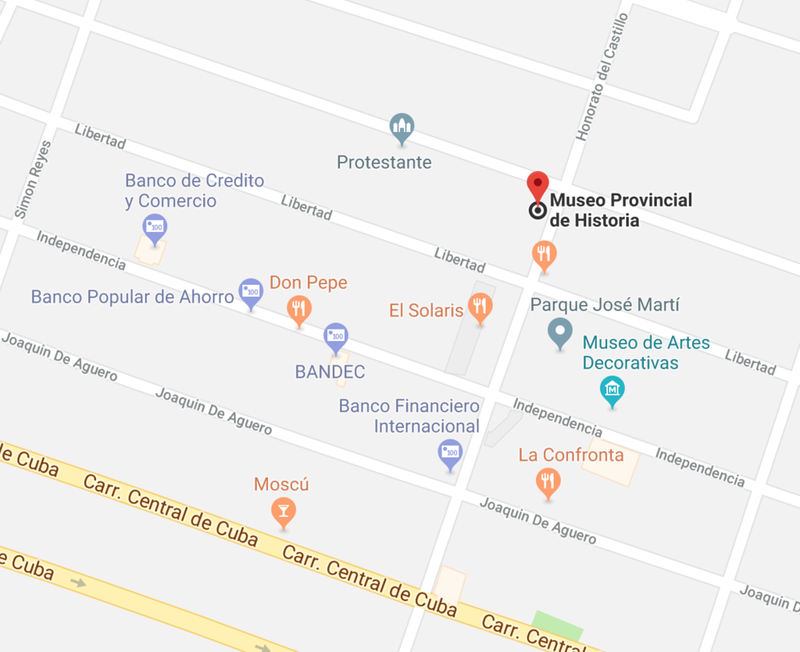 If you walk to the edge of Jose Martí Park, you will come to the Ciego de Avila Museum located in a bright orange building. What looks like a small gallery from the outside is actually a museum packed to the brim with artefacts and information about Ciego de Avila’s history from the pre-Columbian era to the Cuban revolutionary days. Labels in Spanish and a handful in English mark every object in the museum, including a mysterious shrunken head of questionable authenticity. Within the museum walls, stories come alive from the arrival of the Spanish, emergence of Santeria, battle for independence, and glorious days of the revolution driven by Castro. If you are curious to uncover more about local history, this museum is well worth your time. The entrance costs $5 CUC (equal to $5 USD) and an extra $1 CUC if you would like to take photos inside. Hours: Tuesday to Friday 9am to 5pm; Saturday 8:30am to 4:30pm; Sunday 8am to 12pm; closed on Monday. With a different themed party every night of the week, the Cabaret Bohemio on Calle Independencia is the place to see and be seen. A night out at the cabaret will give you a taste of the wide range of dance which Cuban culture encompasses. Dancing is a HUGELY important part of Cuban culture; it’s difficult to go anywhere on this island without witnessing a little cha-cha-cha, danzón, mambo, or salsa. The Cabaret Bohemio is the to dance your heart out and kick back a couple of mojitos. Head out on a Friday, Saturday, or Sunday to enjoy a botellón (a street party) with the locals in Parque Jose Martí. 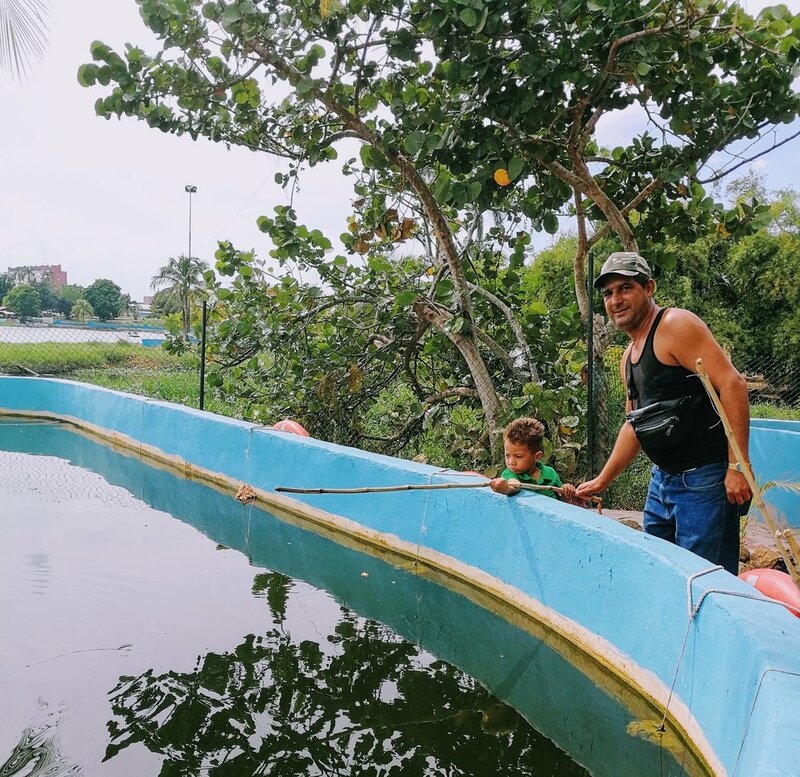 Once the sun goes down, young couples, active children, and friendly elders come out to socialize and drink in Ciego de Avila’s central park. Jose Martí was a Cuban independence fighter and writer whose name you will note across the country. This main park is just one of the many public spaces dedicated to this independence hero, who you will undoubtedly learn more about on your trip. The line outside of La Coppèlia on an average afternoon in Ciego de Avila, Cuba. The ice cream might not be the best you’ve ever had, but the experience of going to la Coppèlia is one of a kind. Coppèlia is a state-run ice‑cream parlour that serves over 4,250 gallons (16,100 liters) of ice cream to around 35,000 people every day in Cuba. This chain is beloved by Cubans and their families; an ice cream sundae will only cost you around 3 CUP. Coppèlia only does business in CUP’s, so remember that Cuba has two currencies (1 CUC = $1USD = 25 CUP). The best time to visit the two-story la Coppèlia on Calle Independencia is probably around siesta time, 3 or 4 in the afternoon, when the line is the shortest. Just ask the people waiting in line where to stand and wait to be seated. If your party is under four people, you will likely be seated with another group since Coppèlia is always crowded. Eating at Coppèlia gives you an authentic glimpse into family life in Ciego de Avila. Also if you are craving a sundae, be warned that the caramel sauce is more or less just sugar and water mixed together with caramel flavoring and the whipped cream is almost like a melted marshmallow goop. But when it's 100 degrees fahrenheit (38 celsius), ice cream is ice cream.